There's so many colors available (check them out here), and you can also get the priming 'glue'. But don't let the name fool you, this stuff is not sticky and while it provides a great holding medium for the glitter, it's not impossible to remove. The best thing about this is don't limit it to just your eyes, use it on your body, hair, etc. 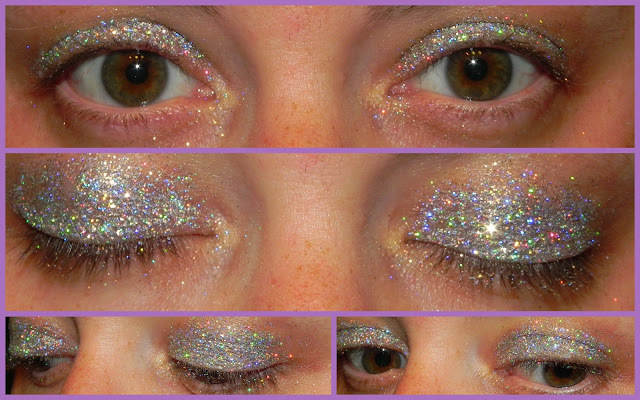 I love just a light wash of this on the lids, it's perfect for a night out with the ladies and hello holo sparkle! Isn't it great? Applying just a thin line near the lashes would be fun for daytime too. Now my favorite use for this? Well since it's cosmetic grade glitter, of course it would be perfect to make glitter nail polish! Snip a tiny piece out of the one of the bottom corners. Make sure that when open it's still small enough to fit in the mouth of the bottle. This is your funnel. Hold it fully in place, and then pour your desired amount of glitter into the funnel. I used about 1/6 of the pot, you can add more or less depending upon the coverage you want. I made mine a light/medium coverage. Put the brush back in, it will look pretty clumpy. Shake it for a few minutes to evenly distribute all the glitter. Since I just did my nails, the only thing I had to model the polish on was my toes! Sorry for the toe pic lol! But you can see the holo topcoat on the left, and not on the right so you can tell the coverage that I achieved. This is only wearing one coat of holo, as well! Now here's the best part! BA Star is generously offering Smart n Snazzy readers 50% off their purchase with code BBGLITZ! The glitter pot (as well as the glue) costs $8.75... so with this discount you can get two for that price! Check out all the colors they offer, and make some awesome glitter polish for yourself and for gifts! Disclosure: I received payment in the form of the product featured as part of a campaign with Brand Backer. As always, all opinions are my own!